Simplemente porque es de la famila Parulidae, la familia con más representantes de aves migratorias en la Península de Osa, les traigo la Reinita de costados castaños (Setophaga pensylvanica), la reinita y ave migratoria más común que se encuentra aquí. De solo 10 cm de largo, esta pequeña es mas reconocida por la línea colorada (costados castaños) bien definida por los lados en el plumaje del macho. También se conoce por andar con la colita hacia arriba, de la manera muy parecida a los Polioptila (gnatcatchers). La Setophaga pensylvanica se reproduce en el norte de los Estados Unidos y Canadá y vuela más de 5,000 kilómetros para pasar los meses de Octubre a Marzo aquí en Osa – un viaje muy asombroso! Cuando está en su hábitat invernal de la Península de Osa, anda en bandadas mixtas dentro de su territorio, regresando al mismo territorio y con la misma bandada en años siguientes. No canta cuando esta en Costa Rica, por estar fuera del periodo reproductivo, pero nos da un “chip” llamativo. Así que, tiene que poner mucha atención para verla, pero cuando la tiene ubicada, no se confunde con ninguna otra ave. Simply because this bird is in the Parulidae family, the family most represented of all neotropical migratory birds on the Osa Peninsula, I bring to you the Chestnut-sided Warbler (Setophaga pensylvanica), the most common warbler and migratory bird that is found on the Peninsula. Of only 4 inches in length, this tiny songbird is most recognized for the chestnut stripe down its sides, especially notable in the breeding male. It is also well known for holding its tail high in the air much like other gnatchatchers in the Polioptila genera. 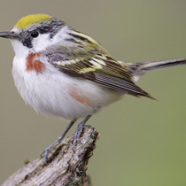 The Chestnut-sided Warbler breeds in the northern United States and Canada and will fly more than 3,000 miles to spend the winter months from October through March here on the Osa Peninsula – an extremely amazing flight. When it is here on its wintering grounds on the Osa, you can find it travelling with mixed species flocks while the flock is within its winter territory, and it will often return to the same territory and the same flock in following years. You won’t hear it singing its normal tune outside of the breeding season, but it does have a distinctive chip. So, though you have to pay close attention in order to see the Chestnut-sided Warbler, once you have found it, you simply can’t mistake it for any other bird! This is another in a string of migratory bird installments leading up to the International Migratory Bird Day Festival Osa Peninsula 2014. Find more information here or on Facebook.